Hi Helmar Fans! 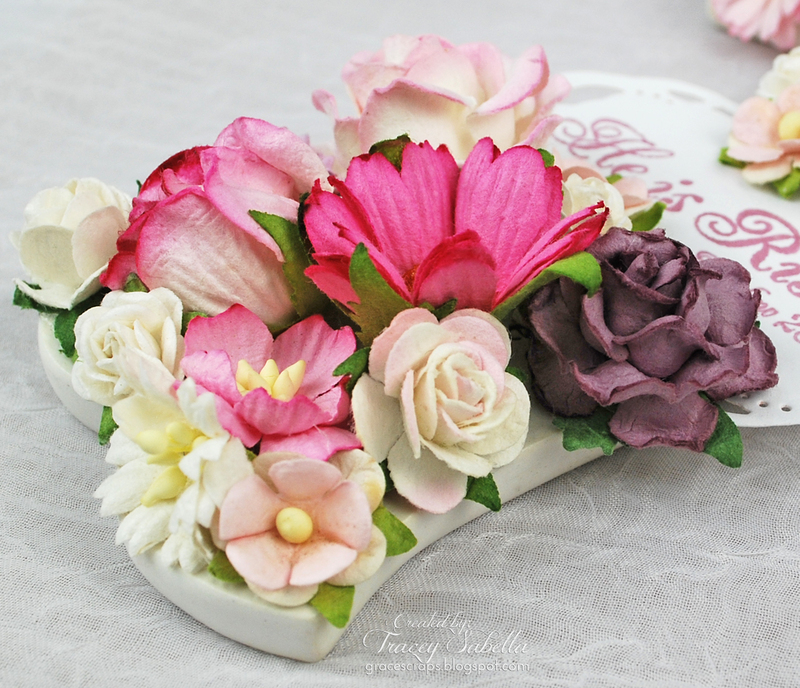 Cathy here with you today sharing a Rainy Day Bouquet created with a pair of Wellies! A perfect quick project to brighten someone's day. It went together in no time at all with the help of my Silhouette Cameo and Helmar adhesives. The flowers were created with my Silhouette and a file that you can find here from Jamie Koay. I cut enough patterned paper and card stock to create 10 flowers for my bouquet. 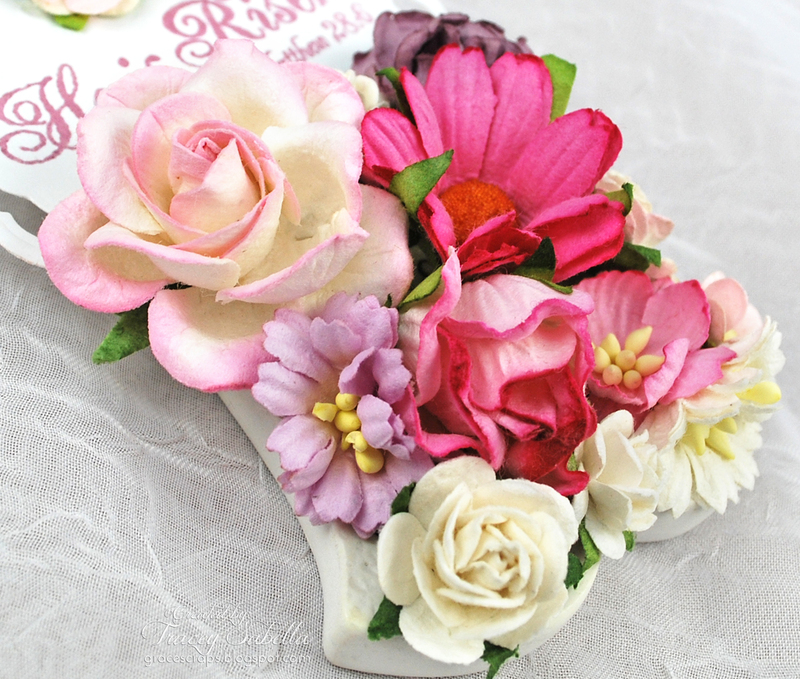 I used the Helmar Quickfix Permanet Adhesive Runner to adhere all the layers of my flowers. Super fast and the runner has such great hold. I next adhered the flowers to the painted stems with Helmar's 450 Quick Dry Adhesive. I love how fast this glue dries, I honestly had all ten flowers glued to the stems in just a couple of minutes. Then I added my buttons to the centers with the Helmar's 450 Quick Dry Adhesive. 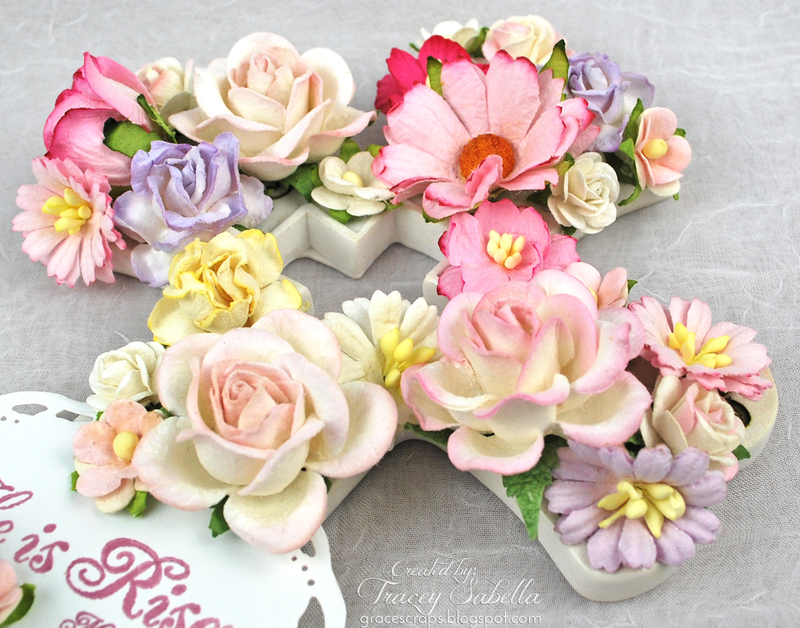 After you have your flowers all assembled, all that is left is to arrange them in your wellies. I used two 3 inch stryofoam spheres inside the wellies and just pushed the flowers into place. A few of them got a little loose when I was trying different spots, so I just added to bit of the Helmar 450 Quick Dry Adhesive right to the tips of the dowels and inserted them....it held like magic. Thanks for joining us here today at Helmar! I was at Michaels a couple weeks ago and saw these bare wooden windchimes for around 1.00 and thought they would make a cute gift! I also picked up these cute wooden letters for the middle of the windchime. If you're looking for a great DIY project try this out! I used Helmar 450 Quick Dry Adhesive and Crakle Medium to complete this project. .
After this was dry, I put on the step 1 and step 2 of the crackle medium. You can then finish with the Helmar Crystal Kote for added protection. I'm going to keep this one inside, but I love how it turned out! Hi everyone, Sandee here with a delightful and easy project guaranteed to brighten anyone's day! I love making mini albums, they are just too cute and lots of fun to decorate. This one is made for a young girl leaving her home for the first time on her way to embark on a new career and a new life. Some inspiring quotes to have on hand, just in case she needs a little bit of uplifting. First thing I did was to stamp the house image, cut out the pieces and then adhere them onto some thin cardboard so they would be sturdy. I love the Helmar Premium Craft Glue, it handled everything from paper to embellishments! Once I recut the images out in their cardboard shapes came the best part of all; embellishing! This is where a great glue can make all the difference! I began by adding the flowers and the chipboard heart to the front cover. Once I had the flowers in place I added my tiny butterfly, which got some uplifting on it's own with help from Helmar Liquid Scrap Dots. I love, love, LOVE this glue and it's ability to place something at just the right height that I want it to be at. After adding a bit to the back of the butterfly I pressed it down and then making sure it had full contact with the paper, and then simply lifted it up to the level where it needed to be. Normally it is not a day of celebration or eleborate decorations but rather a day to reflect. Having children normally means that they will in some way be commemorating this day at School and are usually asked to bring in some flowers for the event. If you are like me and don't always have the opportunity to visit the shops to pick up a bouquet, the garden is the place to go. With a little time you can make this 'home grown' bouquet just as pretty as a store bought one. You will need some sort of red cardstock, hessian/burlap or fabric scrap, red ribbon, black thread, string and Helmar 450 Quick Dry Adhesive. Roughly tear three circles from the red cardstock, each one being slightly smaller than the other. With a moist cloth or baby wipe, gently dampen the edges so that they can be rolled inwards. Glue the circles onto each other using Helmar 450 Quick Dry Adhesive and then glue some of the black fibres to the center. Fray the edges of your fabric or hessian/burlap and attach the red ribbon to the center, once again using Helmar Quick Dry Adhesive. Allow a moment to dry and then attach the poppy together with a bow of string and a 'Lest We Forget' sign printed from your printer. This can then be used to wrap around your bouquet of flowers or even around a vase of flowers on your table for the Anzac Day Lunch. Put a wrap on it! Hello all, Nicole here for my first post on the Helmar Blog. I do most of my crafting with paper, but couldn't help shake things up a bit when I started playing with the adhesives. I've been wanting to make one of these yarn wrapped wreaths for ages and when I got my goodie box of adhesives with the Helmar Foam Glue and Helmar Fabric Glue I knew it was time. My little sister is moving into a new apartment in about three weeks. We are all excited about this move since it puts her much closer to my family and it is a new start for her. I decided to make her a little house warming gift that she can place on her door. She loves the color pink so I kept this fun wreath monochromatic with touches of green. I first started with the wreath base. The foam glue allowed me to get a nice secure anchor for my yarn and I didn't need to worry about it unraveling while I wrapped. Wrap the yarn loosely a number of times around foam (as shown in the above picture) and then go back straightening and pulling tighter. I kept mine pretty neat and tidy by allowing the yarn to overlap a little more at the center of the wreath. At this point you can enjoy your favorite show or pop in a movie. I finished this up in about 1 1/2 episodes of Call the Midwife. At this point I started making the felt flowers. After getting the flowers finished I grabbed my green ribbon to cut leaves. Once you have the base wrapped, flowers rolled, and leaves cut you can now assemble the wreath. I used more Helmar Fabric Glue and attached all the flowers to the yarn base. I then went back and attached the leaves in between the flowers with more Helmar Fabric Glue. I used a length of green ribbon on top as a hanger and the wreath is done. Here is another look at it hanging on my door. Really excited to give this to my sister and welcome her to the neighborhood. Thanks for stopping by today and I hope I gave you some inspiration for using these wonderful Helmar products. Hi everyone Simply Monica here with my 1st post for Helmar. I created a mini Easter album to put photos of my niece and nephew in this year. My kids are way to old for the Easter Bunny so now I use my niece and nephew for all my crafty projects. This is the 1st mini I made for their photos so its packed with a bunch of different things. I wanted to be able to add photos easily. I used nice fun bright colors and used my Helmar Adhesives to hold it all together because it is super thick! Here comes the sunshine and we all know nothing is more amazing than watching the kids run in the sunshine looking for all those eggs! I know they could not be more happier either right?!! That was Epic for sure! Here is a photo showing how thick the album is and my Helmar adhesive is the perfect glue that can keep this mini together. In certain spot I used the Zapdots to add height.. Thanks for stopping by everyone and be sure to leave a comment - love to hear your thoughts! Hello everyone, It's Tracey here to share another Helmar project with you. 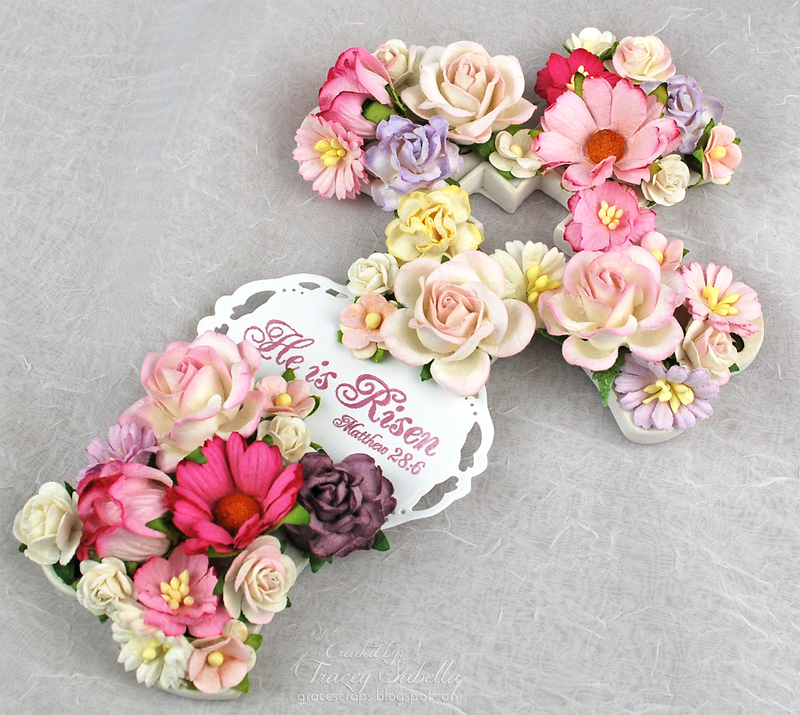 and lots of spring flowers featuring Helmar 450 Quick Dry Adhesive. 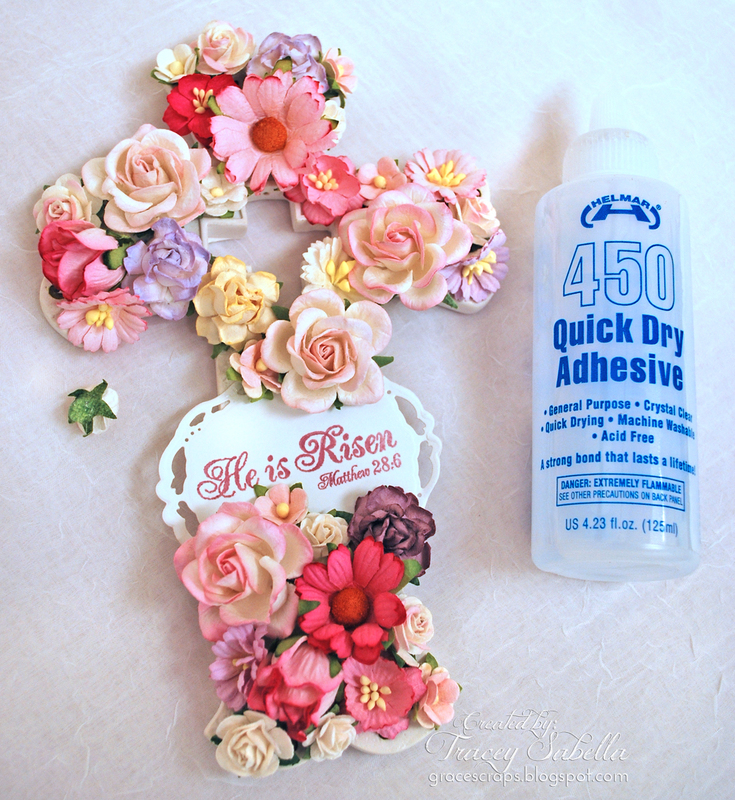 I started out with a resin cross and adhered spring flowers with Helmar 450 Quick Dry Adhesive. As you can see in the photo, I placed a generous squeeze of adhesive on the back of this white rose, then adhered it to the cross. I placed all the flowers and sentiment to get an attractive arrangement, then started adhering. This is the last flower to go on the cross. at an angle using Helmar Liquid Scrap Dots. 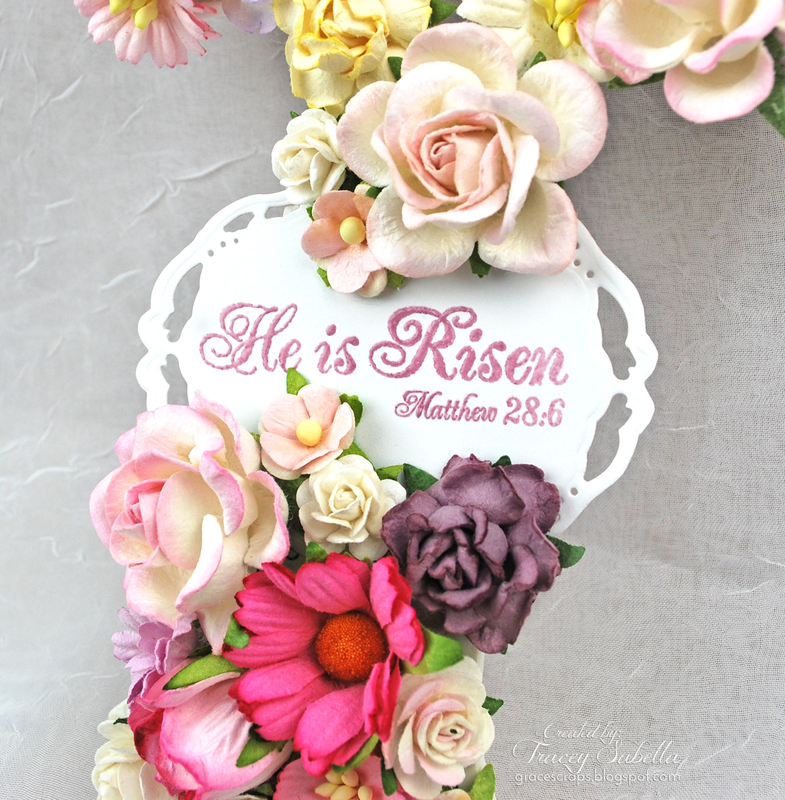 I selected this Easter Scripture stamp to use and die cut a tag to fit the size of my stamp. I stamped in a coordinating color and heat embossed with clear embossing powder for extra dimension. The tag is adhered with Helmar 450 Quick Dry Adhesive. Hello, today I will show you how I created a quick trifold tag mini. 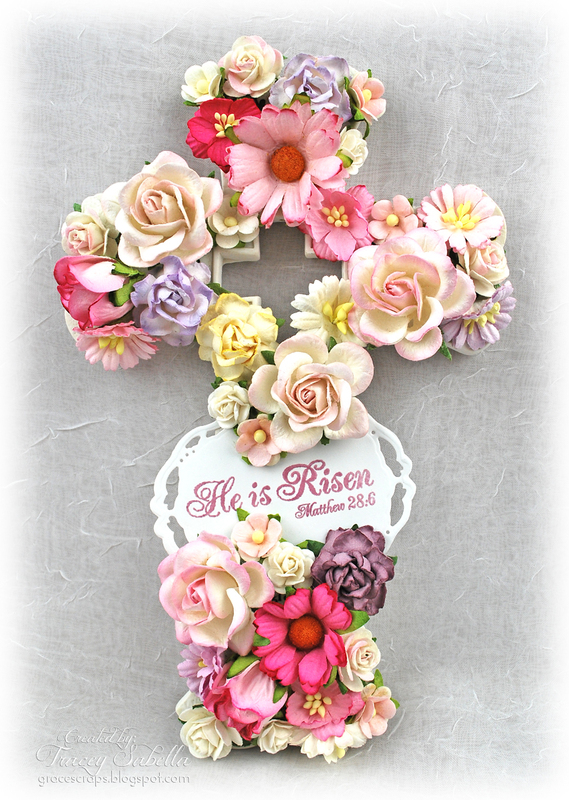 This minibook will beautifully display pictures and journaling of my family's 2014 Easter day. To get started, I used an 3.5"X8.5" tag as my template. I folded my cardstock in half (8.5" X 11.5"), traced and cut two tags on the fold. Next, I adhered the two tags in the direction I perferred the turning of my folds, by using Helmar 450 Quick Dry Adhesive. Now begin covering your tag panels with the textured/patterned paper of your choice. Also add as many layers of embellishments as your heart desire. To add dimension to my embellishments, I used 1/4" white Zapdots double sided adhesives. This size is great for adhering items with narrow spaces. The end result is a beautiful dimensional tag mini that you will cherish for years to come. Here's a view of the inside and back page of the mini. This is the back/inside view. Once folded and tied, this section won't be very visable. I suggest creating a soft bow to allow a peek of the goodness inside. In no specific order please give a big welcome to our new Helmar Design Team! I started scrapbooking in 2001 after the birth of my first born and became quickly hooked. Right now you can find me near St Louis with two boys, a Marine, a cat named Pablo and two dogs! From there my passion went to hybrid and digital scrapbooking and designing. I think my style varies from one medium to the next but I try and find balance in every project that I create ;) I've had many ventures from designing products for Dream Street Papers, Pink Paislee, MiDesign@Michaels, PageFrames, Coolihah App, TapNScrap App and Magistical Memories to being on digital/hybrid and paper design teams. Hello, I’m Tracey and reside in northeast Ohio with my amazing husband, Gary. Our family and faith have always been an important part of our lives. We have been blessed with four wonderful children, and with two weddings in as many years, our family is growing. I'm a shabby chic mixed media artist and enjoy the creative outlet of paper crafting. I’ve been creating and crafting for as long as I can remember and use many of those skills on my projects. I adore learning new techniques along the way and enjoy sharing my projects along with tips and techniques on my blog. I also design for Donna Salazar Designs, Once Upon A…Sketch and Leaky Shed Studio. I’m a huge fan of Helmar products and am so excited and honored to be a part of the Helmar team! Hi there, my name is Jeanette and I am a wife to one, mother to five and carer of five animals and I live in Queensland, Australia. Having dabbled in crafts of one form or another over my lifetime, including sewing, embroidery, patchwork, scrapbooking, digital scrapbook design not to mention countless projects and costumes for children growing up I would now safely say that Shabby Vintage is my preferred style and lace, fabric and paper are my preferred materials. I have a fun youtube channel where I share my crafty life and also a blog. I currently design for MadAboutScrappin and Guest Designed for Lavish Laces. I am delighted and honoured to be a part of the Helmars Design Team. Hi I’m Katie, I am an artist currently living in Dallas. I doodle on everything I can get my hands on and love everything crafty such as scrapbooking, mixed media, drawing, sewing, crocheting, etc, but my favourite projects are always the paper and mixed media projects. One of the most crucial tools used in crafting is of course adhesive and I use a lot of it, so i am thrilled to be on the Helmar design team. I have a blog Punk Projects, where I post tutorials, inspiration and other fun things as well as designing custom shoes in my etsy shop. When I’m not crafting, you can usually find me cycling, camping or working in the garden. I have been paper crafting for 10 years, I love everything there is about this amazing industry. I owned my own scrapbook store for over 4 years, and sold it a couple of years ago when we relocated to the cold northern prairie of Aberdeen, SD. Now you can find me designing and creating in my studio. I love what I do! I have been married to the most wonderful man who supports all of this for almost 28 years. We have two kids, Alex and Maxenzi, two grand kids and a bunch of fur babies! Life is good! Hello, my name is Nicole. I live in northern UT with my three boys: husband Brandon and our two boys Wesley (11) and Thomas (2). Yep, you read that right my boys are nine years apart in age. It has its challenges at times, but it's so much fun to have another little person running around here. I work part time in the mornings as a cake decorator and the rest of the day I'm the regular SAHM. I found scrapbooking when my oldest son was about 7 months old and have been addicted since. I never ever imagined I would be a scrapbooker, but here I am combining my love of color, design, photos, and memories into one love. I've been doing design work in the scrapbook industry for about nine years. I've worked for several scrapbook manufacturers, monthly kit clubs, and have been published in quite a few major scrapbook magazines. Hello, my name is Kisha Walton and I'm beyond excited to become a part of the Helmar DT family. I'm married to the most loving and supportive husband ever, and the mother of two wonderful young men. I work as a Social Insurance Specialist by day and a crafter by night. I dabble in a few different crafts, however scrapbooking has been my heart since 1999 when I first began. I love to create using various textures, mediums, inks and adding lots of layers to my projects. My favourite things to create are cards, layouts, mini albums and altering items. My name is Monica Edwards and I am the mother of 2 older children and I currently work at the Kennedy Space Center and I love it! I have been crafting over 20 years but stepped into the blog world in the past 3 years. I consider my style to be well not sure because I love it all. Some days I am vintage, whimsy, fun and bright just depends on the mood I am in. My goal is to inspire others through my work and I would like to say your projects are only as good as the adhesive behind it! I'm a bit of a bookworm and I love creating mixed media bookmarks like these. I used Helmar adhesives to not only adhere all of my paper down, but also to add texture. I took a few photos of the process to show you how. The first thing I did on my bookmarks, was to spread Helmar Craft and Hobby PVA Glue onto the back of a couple of gelli prints and stuck them down onto my bookmarks. Then I used the Helmar Craft & Hobby PVA glue to add tiny dot around the edges of my bookmarks. The trick to this is to only open your glue nozzle a little bit, if it's too loose a lot more glue will come out. I just wanted small dots. After the glue was fully dry, I smeared gelatos over it. and used my finger to blend them in. To make my textured glue dots stand out a bit more, I went over them with a gold paint pen and also added a bit of stamping. I always like to finish my bookmarks with a quote about reading, so I printed one out and use my Helmar Quickfix Adhesive Runner to stick it down. After that, I went over the whole thing with Helmar Crystal Kote Gloss Spray to give it all a finished look and to seal the mediums like gelatos. Have you ever used glue as texture? It's one of my favorite mixed media techniques.